Responding to reports that the Irish Naval presence in the Mediterranean will cease and Operation Sophia will be downscaled and end in six months, the Irish Refugee and Migrant Coalition (IRMC) today expressed serious concerns. The Coalition comprises 23 organisations that seek to advance the rights and dignity of people on the move and those in need of international protection. “The 1951 Refugee Convention, in the wake of World War II, established the right to special protection for those fleeing persecution. Ireland as an EU leader must uphold this fundamental principle, rather than aiding and abetting the further persecution of refugees. ActionAid’s experience in both the home countries and receiving countries of migrants tells us that walls, barbed wires and guns will not stop desperate people from seeking a better future. Ireland’s response must find solutions based on the legal frameworks and human rights principles to which we are already committed; instead of rowing back, Ireland can and should do more, along with other EU leaders, to increase resources for the real integration of migrants, who have so much to offer our societies”. 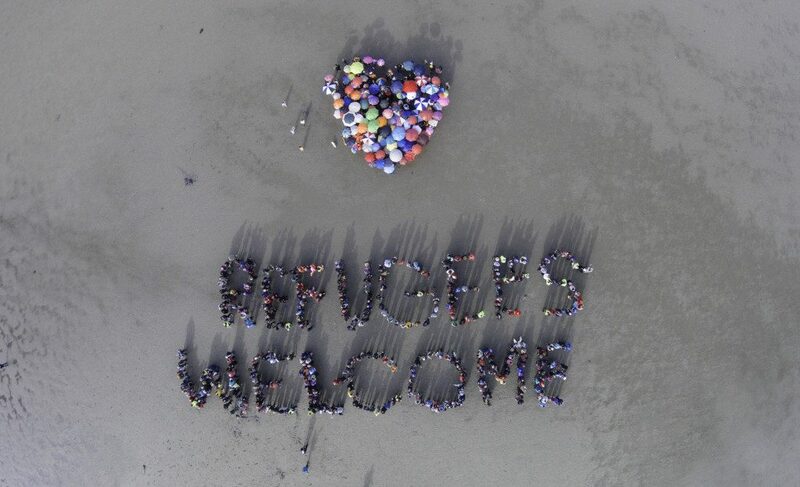 Picture: Members of the public joined a coalition of NGOs on Dublin’s Sandymount Strand Sunday 13th September 2015.